An adorable fawn and rabbit have been nicknamed Bambi and Thumper after they were spotted playing together in the Rocky Mountains. A video shows the duo jumping around and chasing one another during what looked like a playful game of tag near the Lula W Dorsey Museum in Estes Park, Colorado. YMCA of the Rockies shared the video on its Facebook page on Tuesday and it has since been watched more than 472,000 times. Museum guide volunteers Steve and Vicky Johnsen shot the footage of the real-life Bambi and Thumper on August 6. 'It just brightens everyone's day when they watch it,' YMCA of the Rockies spokeswoman Martha Sortland told ABC News. 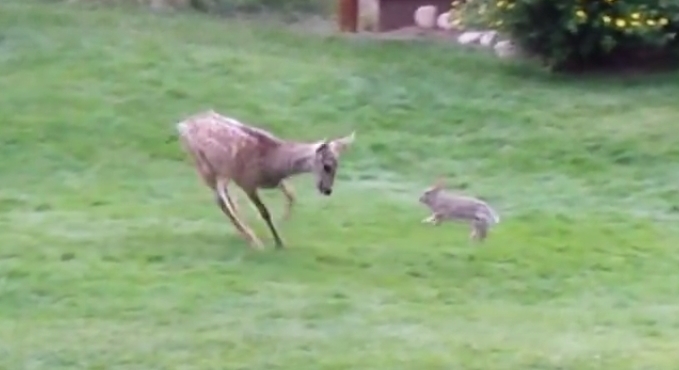 Responses to "Adorable real-life Bambi and Thumper play together in Colorado Rockies"